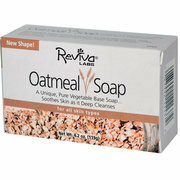 Reviva Labs Oatmeal Soap Description: A unique, pure vegetable base soap...ideal for all skin types. Soothes skin as it deep cleanses. Oatmeal Soap soothes as it deep cleanses. It has a mild exfoliating action that leaves skin with a silky-smooth after-feel. 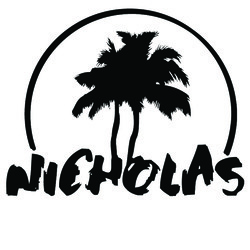 Its non-detergent formula wont upset skins protective balance. Free Of Animal ingredients. Disclaimer These statements have not been evaluated by the FDA. These products are not intended to diagnose, treat, cure, or prevent any disease. Ingredients: Sodium palmate, sodium cocoate, water, avena sativa (oat) kernel meal, sweet almond seed meal, fragrance, glycerin, coconut acid, lecithin, vegetable oil, corn oil, retinyl palmitate, cholecalciferol, sodium chloride, tetrasodium etidronate, pentasodium pentetate, trisodium hedta, titanium dioxide, iron oxides. • Sodium palmate, sodium cocoate, water, oatmeal, fragrance, almond meal, titanium dioxide, lecithin, iron oxides, vegetable oil, corn oil, retinyl palmitate, cholecalciferol, pentasodium pentetate, tetrasodium etidronate.